Optical detection methods have the advantage of being completely non-destructive with respect to the latent fingerprint deposit. As a result, these techniques do not preclude the later application of conventional fingerprint development procedures. The simple observation of an object under white light may disclose a visible fingerprint that can be photographed without any further treatment. On the other hand, more complex optical detection methods, as described below, may reveal otherwise invisible prints that may not be developed by other techniques. A fingerprint detection sequence should intuitively commence with one or more of the following methods. Lasers have, for many years, been proposed for the luminescence detection of untreated fingerprints on non-luminescent surfaces. Three principal types of lasers have been employed to detect inherently luminescent fingerprints – the argon ionic, the copper vapour, and the Nd:YAG laser. Positive results have been obtained on many surfaces, including metal, eg, firearms, human skin, and polystyrene foam. Despite the relatively low success rate of the technique in actual casework, a search for inherently luminescent fingerprints should always precede the application of a destructive detection method. The evidential object should be illuminated at different wavelengths using a suitable high-intensity light source while observing through appropriately filtered goggles. Japanese workers have proposed the optical detection of latent fingerprints by short-wave UV reflection. This technique requires the use of a UV-sensitive CCD camera, equipped with a quartz lens, and a source of UV light. The company Hamamatsu proposes a complete UV reflection system for the detection of trace evidence including fingerprints, footwear impressions and bite marks on skin. In principle, the technique is based on obtaining a contrast between the surface, which may absorb or reflect UV light, and the fingerprint deposit which absorbs some UV radiation and diffusely reflects the remainder. The technique may therefore give either light ridges on a dark background or dark ridges on a light background, depending on the nature of the surface and the composition of the fingerprint deposit. The angle of incidence of the UV illumination is critical for obtaining satisfactory results. The Serious Crimes Unit (SCU) in London routinely uses reflection techniques in both the long and short-wave UV region. In addition, the SCU has reported that the illumination of latent prints on paper using the 266-nm radiation from a frequency-quadrupled Nd:YAG laser, with photographic detection of their luminescence emission in the long-wave UV region, can produce images with good ridge detail. In a laboratory evaluation, they recorded a detection rate of 69 per cent for latent fingerprints sampled from 34 individuals. If the surface does not reflect UV light, but absorbs it as the case with white glossy paper, UV excitation may result in a strong luminescence emission in the visible region. This strong luminescence in paper is due to the presence of optical brighteners. On the other hand, the fingerprint deposit may absorb UV radiation without emitting visible light. The result is that latent fingerprints can sometimes be seen as dark images against a bright background when observed under a UV lamp. Latent fingerprints on smooth non-porous surfaces, such as glass, plastic, and polished metal, can often be detected using episcopic coaxial illumination. 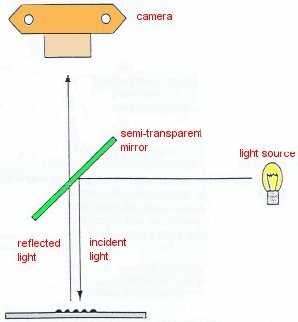 The technique involves the use of a semi-transparent mirror to observe the reflection of light perpendicular to the surface (see below). The light is diffused by the fingerprint deposit but specularly reflected by the surface, the print is therefore visible as dark ridges against a light background. As well as detecting untreated latent prints, the technique also gives excellent results after cyanoacrylate treatment. Fingerprint detection by episcopic coaxial illumination.